The Bedlington Terrier (also known as the ‘Rothbury Terrier’) is a highly unusual Terrier which looks somewhat like a lamb on a leash. The Bedlington Terrier descends from a dog named ‘Old Flint’ born in 1782 which fathered a line known as ‘Rothbury Terriers’. In 1825, a man named Joseph Ainsley in Bedlington, North England, bred two Rothburies and deemed the result a Bedlington Terrier. Future crosses resulted in a quick, sprightly breed adept at hunting foxes, otters, and rabbits. The Bedlington Terrier was later imported to America, where it drew attention with its lamb-like appearance. Bedlington Terriers are a popular breed for earthdog events, in which they scent and track prey through underground tunnels. 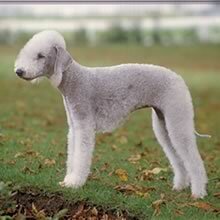 The Bedlington Terrier has a shoulder height of 38-43 cm (15-17 in) and weighs 8-10 kg (18-23 lbs). Bedlington Terriers have thin, rounded heads, almond shaped eyes, and a forehead sloping gently down to the nose with no visible stop or distinct muzzle. They have very distinctive ears which are triangular with a puffy tassel at the tip. Bedlington Terriers have an arched rear, tucked in belly, and long, narrow ‘hare feet’. Their body is shaped more like a Greyhound than a standard Terrier, allowing them to run at great speeds, but unlike Greyhounds their front legs are angled inward, allowing them to change direction quickly. The Bedlington Terrier has short, curly hair reminiscent of sheep’s wool. It does not shed. The coat can be blue, sandy, or liver, and may have tan points. Blue is currently most popular. Bedlington Terriers are born dark colored; their color fades with age. The Bedlington Terrier is playful, loving around children, and intelligent. It does not bark very often. Its soft and kind demeanor complements its soft appearance. On the other hand, Bedlington Terriers (especially males) are fierce fighters when challenged and have been said to have ‘the face of a lamb and the heart of a lion’! The Bedlington Terrier is playful, loving around children, and intelligent. It does not bark very often. Its soft and kind demeanor complements its soft appearance. On the other hand, Bedlington Terriers (especially males) are fierce fighters when challenged and have been said to have ‘the face of a lamb and the heart of a lion’! The Bedlington Terrier gets along well with children. It will get along well with other pets if socialized when young. Bedlington Terriers are not aggressive with strangers. You can find Bedlington Terrier puppies priced from $1900 USD to $3000 USD with one of our credible breeders. Browse through our breeder's listings and find your perfect puppy at the perfect price. The Bedlington Terrier gets along well with children. It will get along well with other pets if socialized when young. Bedlington Terriers are not aggressive with strangers. The Bedlington Terrier requires regular grooming with a brush and comb, as well as a shaping by scissors or visit to a professional groomer several times a year. Bedlington Terriers should not live outdoors. They live 15-17 years or longer and have litters of 3-6 puppies. Bedlington Terriers are highly susceptible to a liver problem known as Copper Storage Disease, which effects 5% of the breed and can only be diagnosed through a liver biopsy. The Bedlington Terrier can be a bit stubborn at times. While it does learn quickly, it is sometimes necessary for its trainer to be a bit stern. The Bedlington Terrier loves to run fast and jump high. It should be given opportunities to do so as often as possible. Bedlington Terriers can tolerate apartment life if exercised daily. Bedlington Terrier Puppies for Sale - Shipped Worldwide! Finding the right Bedlington Terrier puppy can be dog gone hard work. PuppyFind® provides a convenient and efficient means of selecting and purchasing the perfect Bedlington Terrier puppy (or Bedlington Terrier puppies) from the comfort of your home, 24 hours a day, 7 days a week. Take advantage of our PuppySearch or leisurely browse our directory of hundreds of dog breeds, Bedlington Terrier dog breeders, Bedlington Terrier dogs for adoption, and Bedlington Terrier puppy for sale listings with photos and detailed descriptions. Some Bedlington Terrier puppies for sale may be shipped Worldwide and include crate and veterinarian checkup. Many Bedlington Terrier dog breeders with puppies for sale also offer a health guarantee. With thousands of Bedlington Terrier puppies for sale and hundreds of Bedlington Terrier dog breeders, you're sure to find the perfect Bedlington Terrier puppy.